Pete Corey Page 13 of 84 for Pete Corey | Pete Corey is an independent consultant, writer, and web developer based out of Denver, Colorado. He writes weekly articles on software development and his eternal quest to build Cool Stuff™. Written by Pete Corey on Jul 2, 2018. I’ve always been fascinated by live-coded music. Frameworks like Chuck, Supercollider, Overtone, Extempore, and Sonic PI, along with popular performers and musicians like Sam Aaron and Andrew Sorensen have never ceased to amaze and inspire me. That said, whenever I’ve tried to use one of those tools or frameworks to create my own music, I’ve always quickly given up. Maybe it’s because I’m just lazy and learning new things is hard, but I’ve always told myself that it’s because the tools I was using just didn’t fit with how I felt programming music should be. Syntactically, ergonomically, and conceptually, the tools just didn’t jive. And then I stumbled across J.
J and the entire family of APL languages have a beautiful terseness and closeness to the data being operated on. They’re also fundamentally designed to operate on arrays, a data structure ripe for musical interpretation. I’ve convinced myself that if I can learn J, I’ll be able to build the live coding environment of my dreams! That’s a big goal, but I’m taking baby steps to get there. Today, I’ll show you how I managed to make noise with J. My plan for making noise with J doesn’t actually involve my J software producing any noise directly. Instead, it’ll act as a controller that instructs other software on my machine to make noise on its behalf. 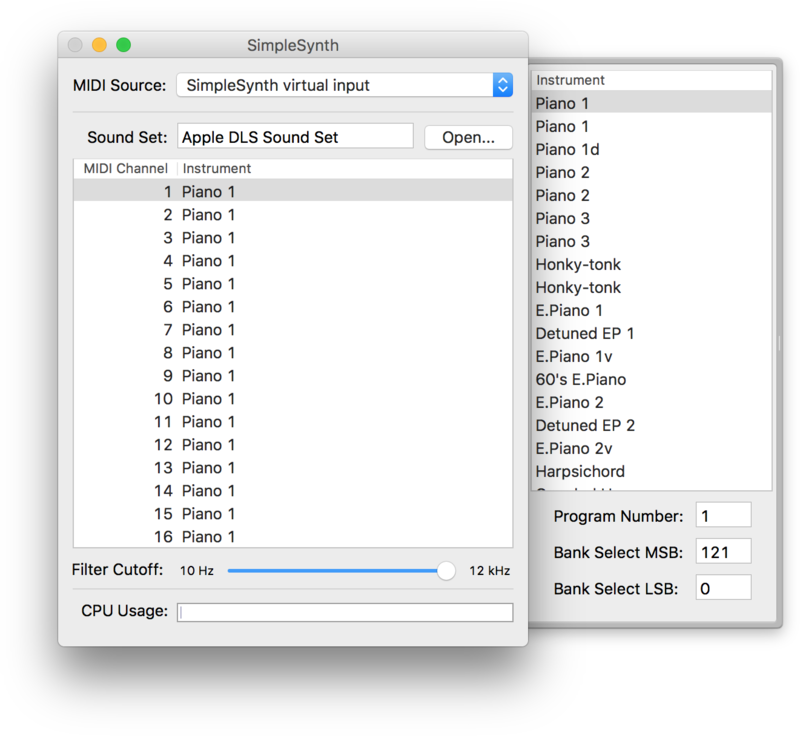 The software making the noise will be SimpleSynth, which is a small, easy to use MIDI synthesizer. If you’re following along, feel free to use any other MIDI synth you’d like, or a full audio workstation like Ableton or even GarageBand. 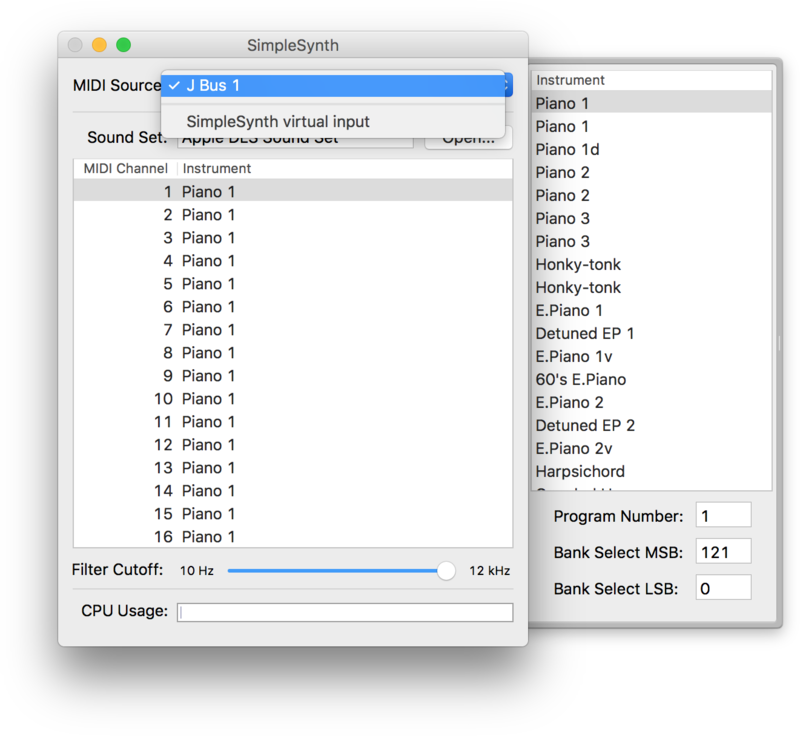 When we fire up SimpleSynth, it’ll ask which MIDI source it should use. MIDI is a protocol that lets us pass around musical information, like when and how loud certain notes should be played, between different devices. SimpleSynth is asking which stream of notes it should listen to and play. Setting up our J virtual device in MIDI Studio. 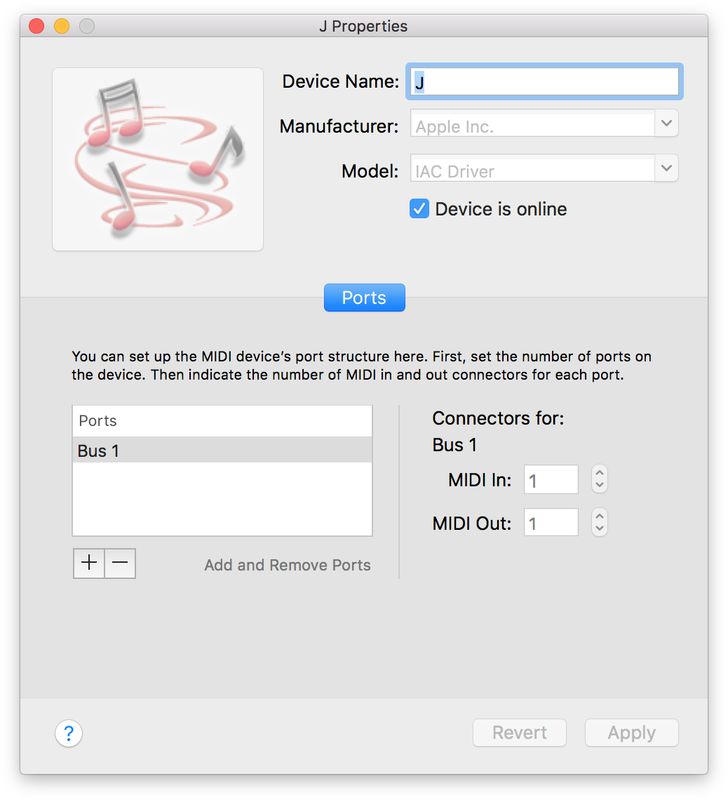 I used MacOS’ built-in MIDI Studio to create a virtual MIDI channel called “J”, with a MIDI port called “Bus 1.” After making sure the virtual device was online, I selected it in SimpleSynth. Selecting our J virtual device in SimpleSynth. The last piece of the puzzle is finding some way of programmatically sending MIDI messages through my “J Bus 1” to be played by SimpleSynth. Geert Bevin’s SendMIDI command line tool did just the trick. Turning on note 60, with a velocity of 100 effectively plays a middle C at full volume. The next challenge lies in getting J to execute sendmidi commands. After much searching and head scratching, I learned that J exposes a wide range of miscellaneous functionality under the “foreigns” (! :) verb. Calling 2! :1 y lets you spawn a new process, running whatever command you pass in through y. While this is great, it’s not much better just running our sendmidi command directly from the command line. What would make things even better is if we could build ourselves a play verb that plays any notes passed to it. The on verb turns an integer note into an “on string” of the format, 'on <note> 100 ', and the play verb spawns the result of appending '/usr/local/bin/sendmidi ...' to append mapped over on applied to y. Put simply, it constructs our sendmidi command and executes it. Please keep in mind that I’m very new to J, and even newer to tacit programming. If you see anything that can be improved, clarified, or corrected, please let me know. I still feel very clunky and slow when it comes to using J. Building this two line program took hours of my time. That said, I feel like there is potential here. As I grow more used to the tacit paradigm and play with other ways of interacting to DAWs and other audio producers, I feel like J might turn into my ideal music creation environment. Written by Pete Corey on Jun 18, 2018. 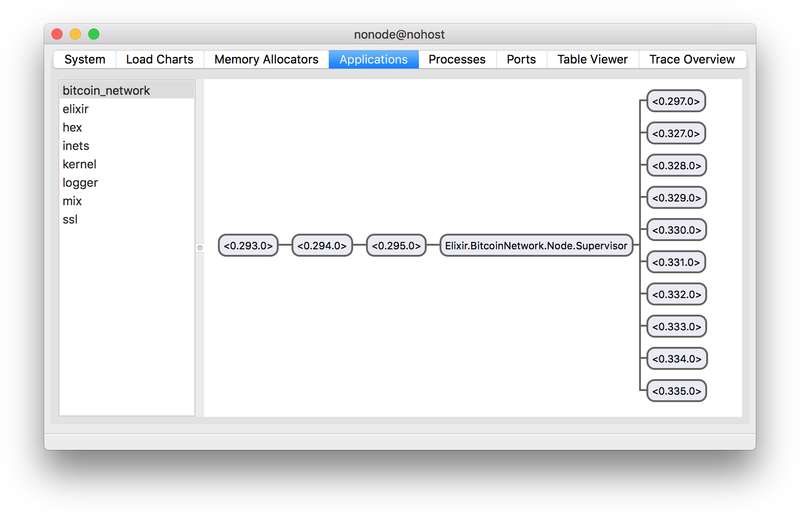 Last month I posted an article about using Elixir’s DynamicSupervisor behavior to recursively connect our Elixir-based node to peers throughout Bitcoin’s peer-to-peer network. The last part of that article talked about how we could limit the exponential growth of our set of connected peers by setting a hard cap on the number of processes supervised by our dynamic Node.Supervisor process. We went through the rigmarole of building this child process cap ourselves, but it was pointed out to me that we could have used DynamicSupervisor’s built in :max_children option to accomplish the same thing! If the number of active peers is less than our specified number of :max_peers, we allow the connection. Otherwise, we return an :error tuple. If dynamic, the number of processes currently being supervised by the supervisor, is less than the specified max_children, add the child. Otherwise, return an :error tuple. This means we can also remove our count_peers/0 helper function. Our limited set of peers. Spinning up our Bitcoin node with a low value for :max_peers shows that our Node.Supervisor is honoring our limit. My final thoughts are that I should really spend more time reading through the Elixir and Erlang documentation. There’s quite a few gems hidden in plain sight that would do me quite a bit of good to know about. I’d also like to thank the Redditor who pointed the :max_children option out to me. Thanks, ParticularHabit! Written by Pete Corey on Jun 11, 2018. But how can we test this functionality without going through the mind-numbing process of manually constructing each packet under test and asserting that it parses and serializes as expected? 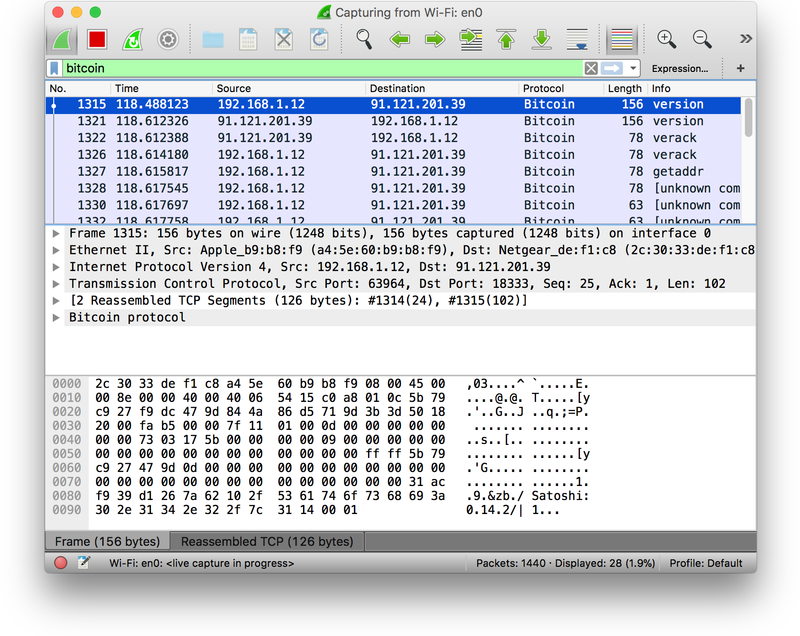 Thankfully, Wireshark’s support of the Bitcoin protocol turns this into a simple task. 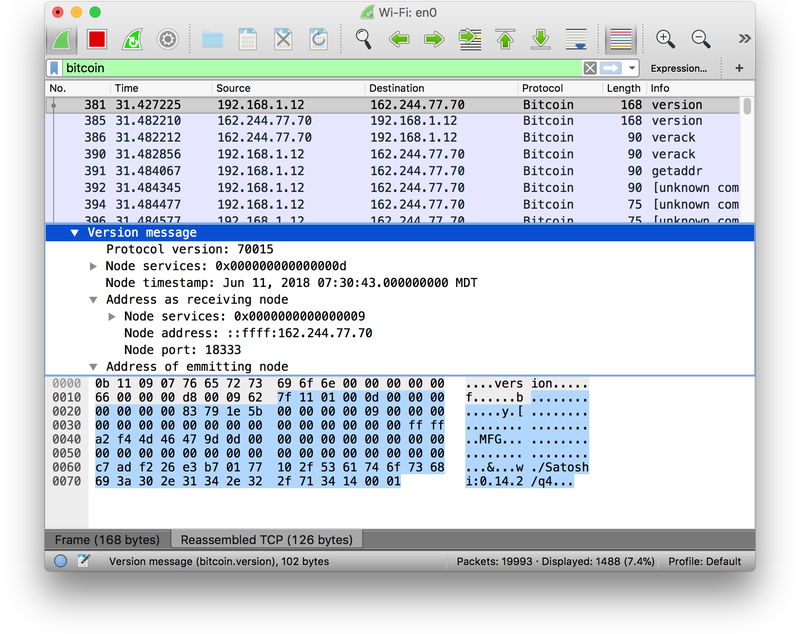 Let’s dig into how we can use Wireshark to generate binary fixtures for each of our Bitcoin packets under test, and explore how we can test against them using Elixir. Bitcoin packets on the wire. The bytes we’re exporting represent the entire packet, as it comes in over the wire. Now that we’ve saved a handful of packets we’d like to test against, we can start the process of incorporating them into our test suite. Let’s assume that we’ve saved all of our exported packets into a test/fixtures folder within our project. Let’s also assume that we want to start by testing our “version” packet (the most interesting packet we’re able to parse, so far). We use Elixir’s File.read/1 to read the contents of our version.bin file, and assert that we’ll receive an :ok tuple containing the binary contents of our file in our new packet assignment. Once again, we assert that we’ll receive an :ok tuple with our resulting message. Because the data we exported from Wireshark relates specifically to our version packet, we expect the list of remaining, unparsed binary data to be empty (<<>>). But where does version come from? How can we know the contents of our version.bin packet without manually parsing it ourselves, byte by byte? 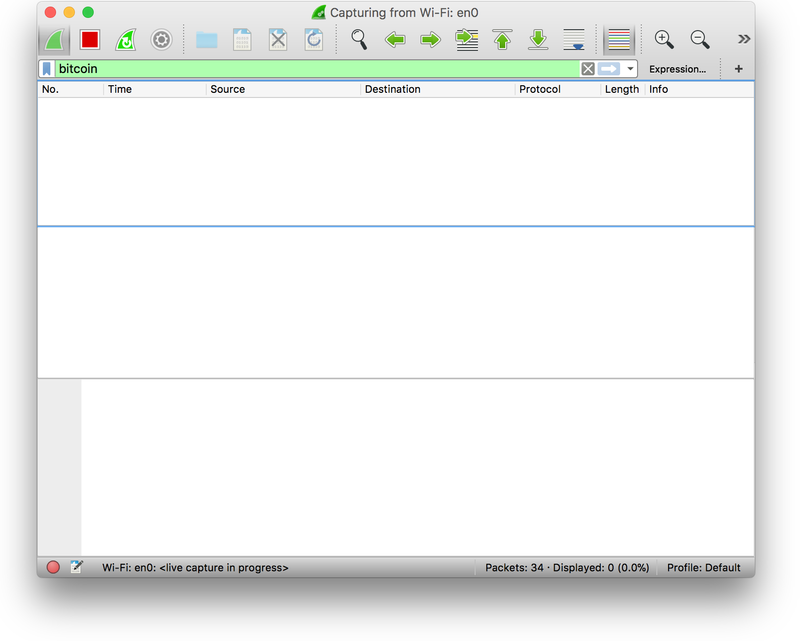 Once again, Wireshark comes to the rescue. 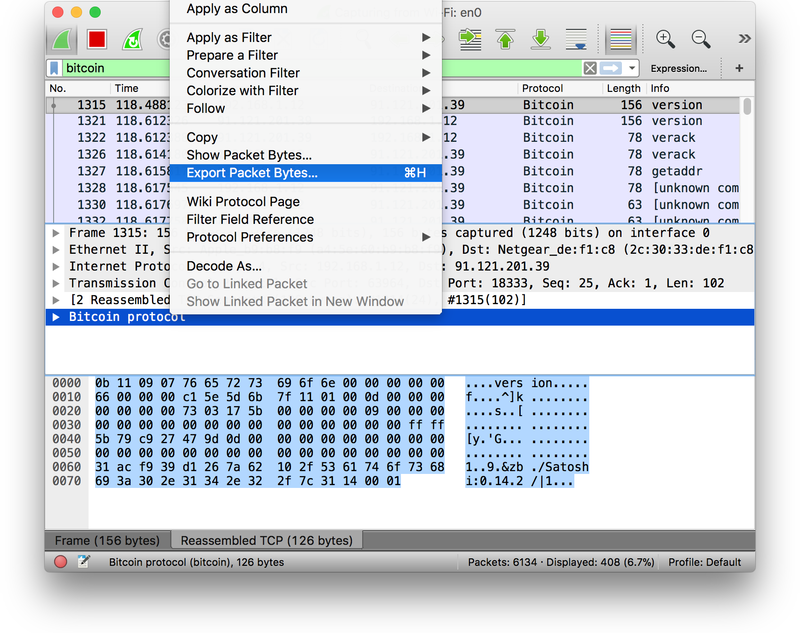 In addition to letting us export our Bitcoin packets as raw binaries, Wireshark also lets us inspect the parsed contents of each of our Bitcoin packets. And with that, we have a solid test of our version parsing functionality. We can test the serialization of our version packet much like we tested the parsing functionality. If our version serialization code is working correctly, it should return a binary identical to the version portion of the packet exported from Wireshark. I’d like to give a huge shout out to Lucid Simple’s article on “Binary Fixtures with Wireshark”. It was a huge inspiration for me and a very well written article. I highly recommend you check it out if you’d like a more in-depth exploration of using Wireshark-generated binary fixtures. For what it’s worth, this kind of testing has already resulted in a positive return on investment. Shortly after implementing these tests, I noticed that my version struct was incorrectly serializing messages, resulting in some strange behavior I’d been noticing with my node. Using the tests as a guide, I was able to quickly fix my implementation.